Stranger Than Fiction screens seven films co-presented with DOC NYC’s “Short List” section. See all these award contenders for FREE with the purchase of a STF Winter Season pass; or purchase tickets to individual shows. The official Winter Season will run Jan. 31 – March 20. Buy a Season Pass now, and get all 15 films for $100 ($80 for IFC members), free popcorn at all shows, and a free DVD from Docurama. Click below for full line-up. To purchase tickets or season pass, click on film page “buy ticket” link, then select 8:00pm. 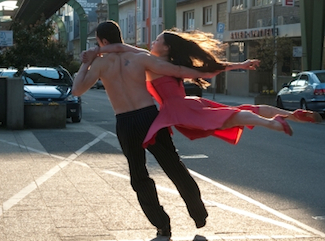 Wim Wender’s (Wings of Desire, Buena Vista Social Club) dazzling foray into 3D began as a collaboration with legendary choreographer Pina Bausch, an attempt to re-imagine her dance on the big screen. When Bausch died suddenly in 2009, Wenders forged on, turning the project into a moving tribute to her groundbreaking work with the Tanztheater Wuppertal ensemble. With longtime members of the troupe re-creating classic pieces, PINA delivers an exhilarating journey deep into Bausch’s world. As a drill instructor he lived and breathed the “Corps” and was responsible for indoctrinating thousands of new recruits with its motto Semper Fidelis or “Always Faithful.” When Jerry’s nine-year old daughter Janey died of a rare type of leukemia, his world collapsed. As a grief-stricken father, he struggled for years to make sense of what happened. His search for answers led to the shocking discovery of a Marine Corps cover-up of one of the largest water contamination incidents in U.S. history. SEMPER FI: ALWAYS FAITHFUL follows Jerry’s mission to expose the Marine Corps and force them to live up to their motto to the thousands of soldiers and their families exposed to toxic chemicals. His fight reveals a grave injustice at North Carolina’s Camp Lejeune and a looming environmental crisis at military sites across the country. For Buck Brannaman, the charismatic figure who inspired The Horse Whisperer, horses are a mirror of the human soul. This richly textured and visually stunning portrait follows Brannaman as he teaches people to communicate with animals through instinct, dramatically transforming horses-and the humans working with them-through understanding, compassion and respect. Like a real-life Friday Night Lights, this emotional film paints an enthralling portrait, whether or not you care about football. Volunteer coach Bill Courtney takes over a beleaguered high school program in urban Memphis where players are more likely to go to jail than to college. Filmmakers Dan Lindsay and T.J. Martin follow the team’s season with masterful camerawork, vivid characters, and gripping plot twists. Hoop Dreams director Steve James delivers another non-fiction epic set on the streets of Chicago, following an organization called CeaseFire, comprised largely of former gang members who are trying to break the cycle of urban violence. James, teaming up with producer Alex Kotlowitz, author of the acclaimed book There Are No Children Here, immerses us into a world that feels like a real-life version of The Wire.